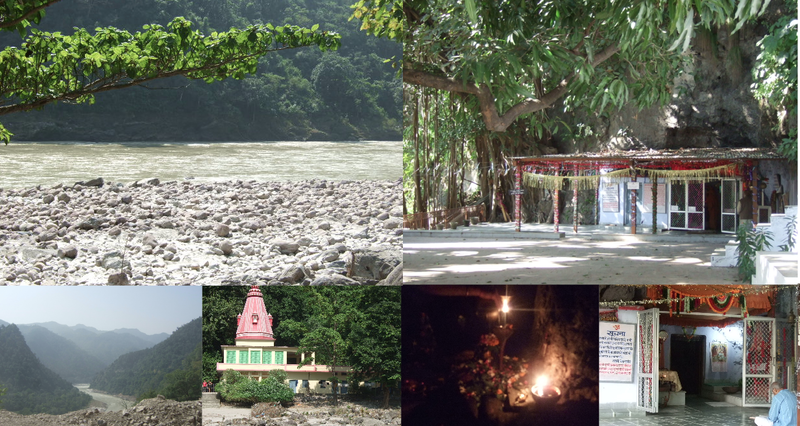 excursions in the area of Rishikesh. Scenically located where the Ganges river comes down from the Himalayas, Rishikesh is a small town in the Himalayan foothills of Northern India and known as the gateway to the Tehri-Garhwal region of Uttarakhand, the state also known as Dev Bhoomi, the Land of God. 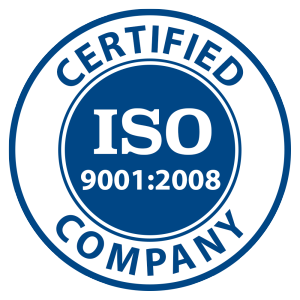 The Char Dham Yatra (pilgrimage to Gangotri, Kedarnath, Badrinath, Yamnotri) ideally begins here. Numerous myths and legends are associated with this place and it is here where from ages onwards Yogis and Rishis have been doing their Tapasya (austerities/ spiritual discipline for purification). 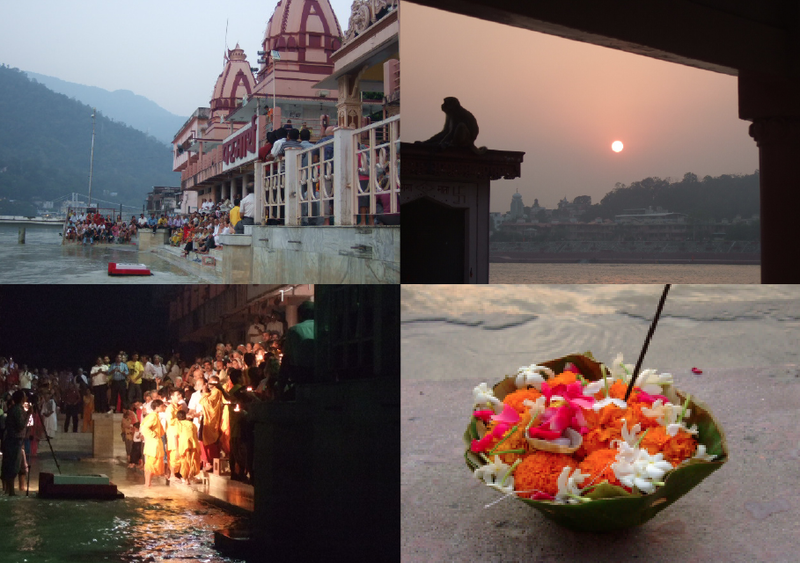 Nowadays Rishikesh attracts many pilgrims and tourists each year, from India and all over the world. Rishikesh became famous in the West when the Beatles stayed at Maharishi Mahesh Yogi’s ashram (now closed), and the town is still known as the world capital of yoga. 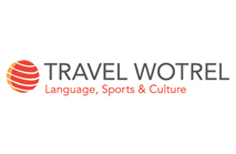 Besides making a pilgrimage to the holy places, famous temples and ashrams of the region, you can also choose to indulge in a host of adventure sports including river rafting, trekking, mountaineering and camping. Major attractions, apart from the fragrance of spirituality and amazing vibrations that have lasted through the centuries: magnificient nature, clean air, clear waters, serene atmosphere, there are numerous temples, ashrams, world-renowned yoga schools and meditation centres, the evening aarti (light ceremony) with enchanting mantras and bell echoes on the banks of Ganga, shops selling religious paraphernalia (brass work and local craft), clothing, spices, sweets, CDs, spiritual books… Note: Rishikesh is officially vegetarian (and alcohol is prohibited). The closest domestic airport from Rishikesh is Dehradun’s Jolly Grant Airport, just 15 km away. The temple (situated at a height of 1330 m) is one of the most revered holy shrines dedicated to Lord Shiva and a prominent Hindu pilgrimage site. 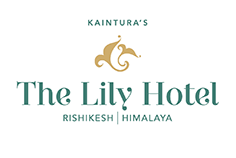 It is surrounded by dense forests and is adjacent to the mountain ranges of Nar-Narayan (ca. 30 km from Rishikesh). It is enveloped between the valleys of Manikoot, Brahmakoot and Vishnukoot. 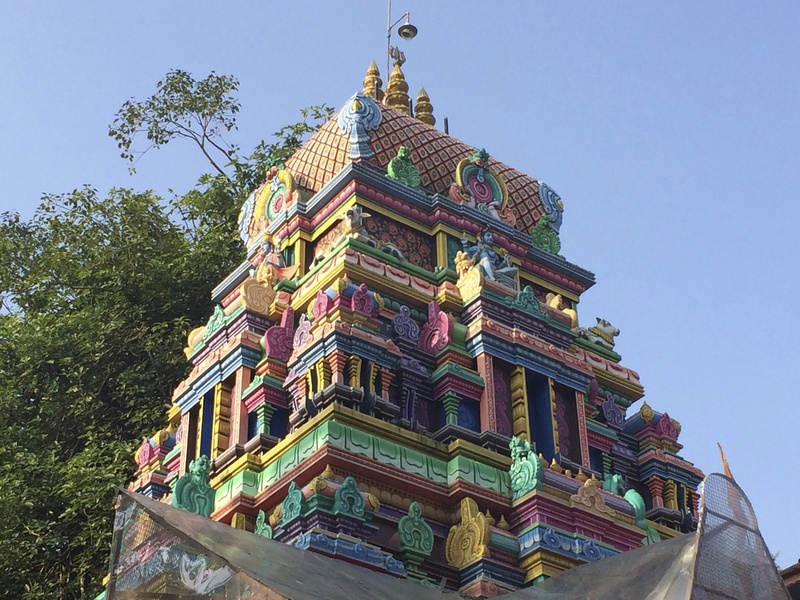 According to Hindu mythology, the place where the Neelkanth Mahadev Temple currently stands is the sacred location where Lord Shiva consumed the poison Halahal originated from the sea when the Devas (Gods) and Asuras (Demons) churned the ocean in order to obtain Amrita (nectar of immortality). This poison that emanated during the Samudramanthan made his throat blue in color. Thus, Lord Shiva is also known as Nilkanth, literally meaning The Blue Throated One. Samudra manthan or Churning of the Ocean of Milk is one of the best known episodes in the Hindu mythology. The story appears in the Bhagavata Purana, the Mahabharata and the Vishnu Purana. In a legendary battle the Devas (Gods) were defeated and the Asuras (Demons) gained control over the universe. The Devas sought help from the god Vishnu Who advised them to treat asuras in a diplomatic manner. Devas formed an alliance with asuras to jointly churn the ocean for the nectar of immortality and to share it among them. The churning of the Ocean of Milk was an elaborate process. Mount Mandara was used as the churning rod, and Vasuki, the king of serpents, who abides on Shiva’s neck, became the churning rope. The demons demanded to hold the head of the snake, while the gods taking advice from Vishnu, agreed to hold its tail. As a result the demons were poisoned by fumes emitted by Vasuki. Despite this, the gods and demons pulled back and forth on the snake’s body alternately, causing the mountain to rotate, which in turn churned the ocean. However, once the mountain was placed on the ocean, it began to sink. Vishnu, in the form of a turtle Kurma, came to their rescue and supported the mountain on his back. 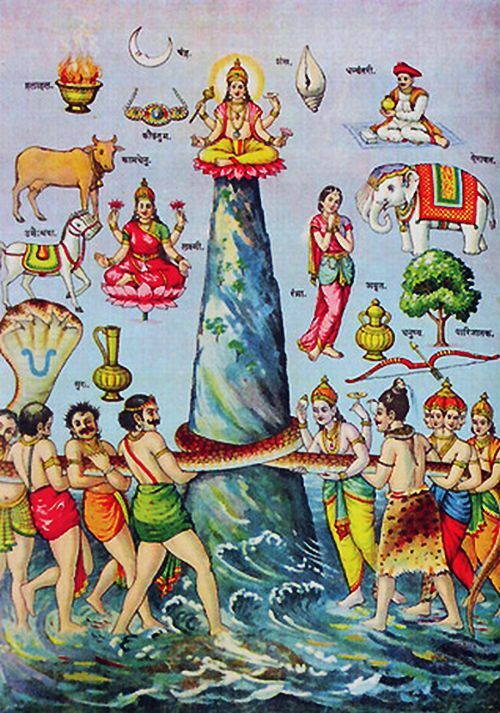 The Samudra Manthan process released a number of things from the Milk Ocean. One product was the lethal poison known as Halahal. This terrified the gods and demons because the poison was so powerful that it can destroy all of creation. Then the gods approached Shiva for protection. Shiva consumed the poison in an act to protect the universe, and his wife Parvati pressed her hand on Shiva’s throat to save the universe. As a result, Shiva’s neck turned blue. Architecture: The tower of the temple is adorned with sculptures of various Devas and Asuras depicting the Samudramanthan. Neelkanth Mahadev in the form of Shivalinga is the presiding deity of the temple. The temple complex also has a natural spring where devotees usually take a holy bath before entering the premises of the temple. In the temple there is also a smaller sanctum where a sacred fire burns permanently, for purification. You can also get a blessing by a priest who marks your forehead with ‘tikka’ in the shape of Shiva’s trident. Festivals: The temple observes two fairs that are held annually on the occasions of Maha Shivratri (Feb-Mar) and Shivratri of Shraavana (July-Aug) during which the devotees (Kawarias) trek from Haridwar to Neelkanth Mahadev Temple. Maha Shivaratri is the most prominent festival celebrated in the temple. The devotees who pay a visit to Neelkanth Mahadev make an offering of Bael leaves, coconut, flowers, milk, honey, fruits and water to the Lord Shiva. Located around 15 km away from Rishikesh, hidden in the mountains at an altitude of 1650 m, this temple gives breathtaking views of the sunrise and sunset. 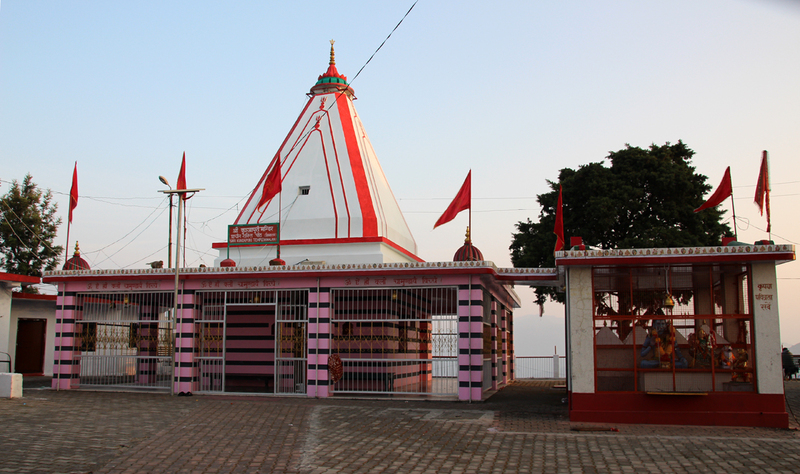 Kunjapuri Devi temple is dedicated to deity Durga (the Universal Mother or Goddess Mata Durga Bhawani) and its legend is connected to goddess Parvati, Shiva’s wife. In fact Kunjapuri is one of the 51 Shakti Peethas, places of worship consecrated to the female entity Shakti, the female principal in Hindu mythology and giver of life and fertility. As foreseen by Shiva, Sati being an uninvited guest was not given any respect, moreover her father Daksha insulted Shiva: during the ceremony she found that offerings had been made to all the gods except Shiva, which was a deliberate insult. So she went forward and told her father that he was cursed because he had not made obeisance to Lord Shiva. She said that she would give up her body which had been born from him and she had the name Dakshayini which meant, daughter of Daksha but she could not bear to be called that any more. And Sita goes on like this: “I cannot bear to continue in this body born of you. This body of mine is now despicable. Persons like you who engage in fruitive activities by performing great sacrifices are concerned with satisfying their bodily necessities by eating foodstuff offered as a sacrifice. We can exhibit our opulences simply by desiring to do so. This can be achieved only by great personalities who are renounced, self-realized souls. Do not entertain a false notion that you are rich and powerful. I am ashamed to be called Dakshayani any more”. So saying she sat down, invoked air and fire by yoga and her body was consumed by the fire so generated (she lifted her prana to the sahasrara chakra and gave up her life). The ganas flew back to Shiva and gave him the news. He was furious and dashed a portion of his hair on the ground (out of which two fearsome figures called Bhadrakali and Virabhadra appeared). He went to the yajna venue place along with his ganas and not only destroyed the whole yajna but also killed Daksha. The gods then went to Vishnu and begged him to be allowed to complete the yajna. Shiva relented and he agreed to come along with them to give back life to Daksha, but now with a goat’s head. All of them went to the yajnashala to complete the ceremony. Lord Vishnu announced at the finale of the yajna as follows: “I am known as the supreme cause of the worlds, its soul, its ruler, the witness of everything, the self-effulgent being and attributeless Absolute. But in truth I am both Brahma and Rudra. I assume different names appropriate for the creation, sustenance and dissolution of the universe. He attains eternal peace who does perceive no difference among us three”. Though Shiva had forgiven Daksha, he was filled with sorrow over the death of his wife. Grief stricken he carried around her lifeless body and was inconsolable. This launched the whole world into sorrow and no one knew how to get out of it. Then the gods went once again to Vishnu and begged him to restore order in the world and to stop Shiva. So Vishnu went after him and cut off Sati’s body with his disc, the Sudarshana chakra (disk-like weapon with serrated edges, used for the ultimate destruction of an enemy, considered to be the most powerful weapon in Hindu mythology). Sati’s body was cut into 108 pieces which fell down at different places which are the Shakti peethas – concentrated places of the divine mother’s energy. According to hindu mythology the manifestation of the Sati Mata idol was done by Vishnu in 108 parts, however, the 51 Shakti Peeths are specifically sanctified spots, where a particular portion of the great Goddess’s body fell to earth. At last when nothing more was left, Shiva came to his senses, but refused to talk to anyone, went to the Himalayas and started intense tapas. Kunjapuri is the place where Sati’s breast has fallen. Kankhal near Haridwar is where the Daksha yagna was done. The saga goes on: the daughter of Daksha, after giving up her body was born anew and again chose Lord Shiva as her beloved husband. The temple offers panoramic view across the Himalaya snow peaks – one can see almost all the peaks of Garhwal Himalayas e.g. Bandarpoonch (6316m), Swarga Rohini (6252m), Chaukhamba (7138m). 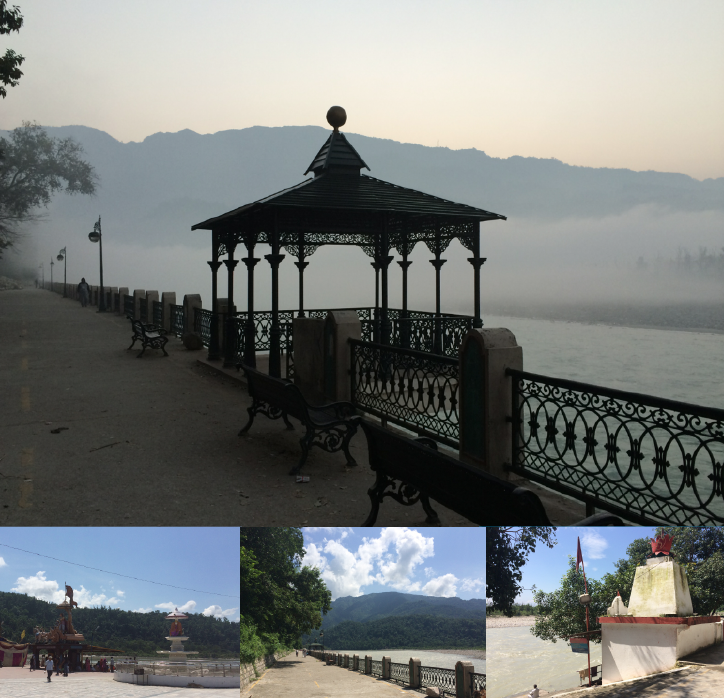 Recommended: instead of driving back, there is a beautiful and easy trek back to Rishikesh (3-4 hours). Duration of this trip (temple visit incl. trekking): half a day/early morning for sunrise til midday. Daily Ganga Aarti at Parmath Niketan Ashram. The most ancient of Indian rituals, the Ganga Aarti fire ceremony, is a worship event in front of Parmath Niketan ashram, right on the banks of Ganga. 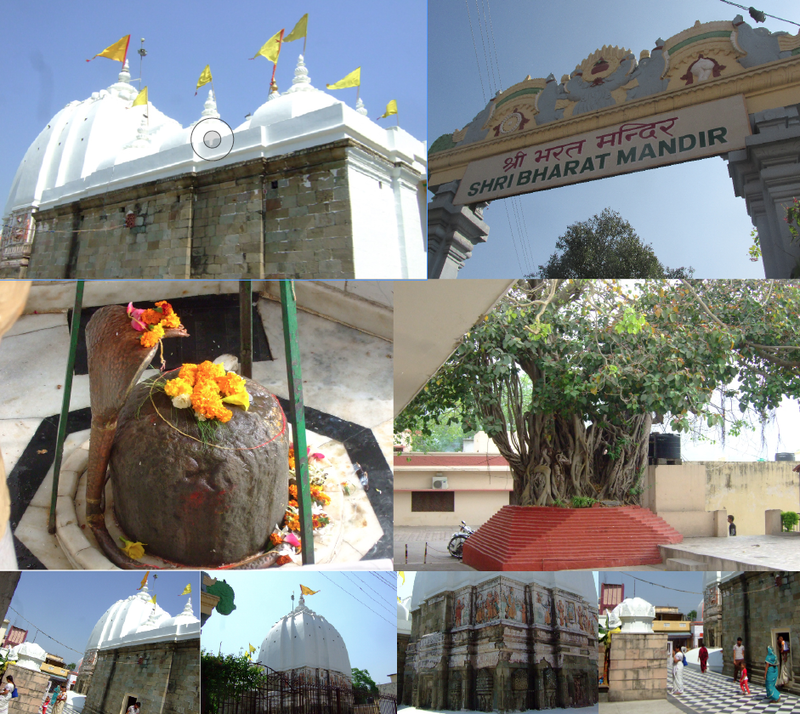 Bharat Mandir founded by Adiguru Shankaracharya. It said to be the oldest temple here. This 9th century temple has the deity of Lord Vishnu carved out of a single black stone popular as Saligram, in the inner chambers of the temple. The original temple was said to have been destroyed in 1398 AD. Go there during the spring festival, celebrated as Basant Panchami. 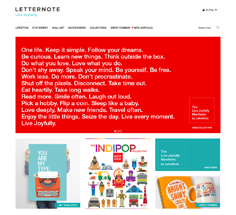 Situated ca. 6 km from Tapovan/Lakshman Jhula, this natural waterfall can be reached after a 2 km walk from the ticket office. 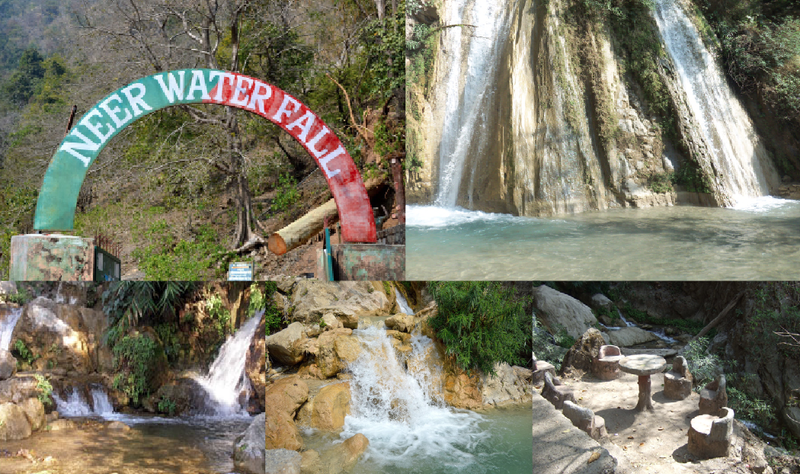 There are also smaller waterfalls and clear water pools amidst forests. Many species of butterflies and plants. You can also come along a beautiful and longer trekking path from Kunjapuri temple. 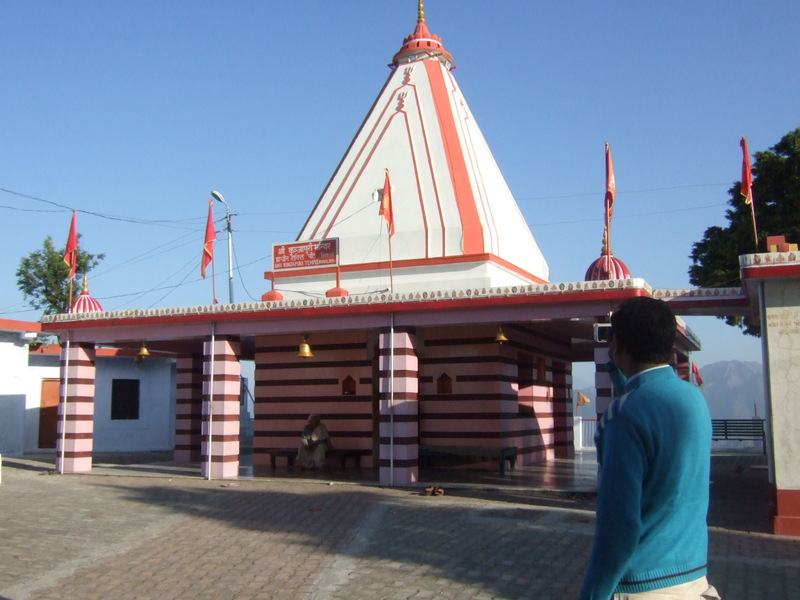 This Mandir is one of the nicest temples in Rishikesh and can be reached either by walking from Triveni Ghat, along Astha Path, or from the highway (72 steps downwards from the main entrance arch). Triveni Ghat is situated bank of the holy river Ganges. It is the confluence of three holy important Rivers the Ganges, the Yamuna and the Saraswathy. This spot is used for a holy bath by most pilgrims. The main daily attraction is the evening Aarti for Goddess Ganga also called “Maha Aarti”. Astha Path means “Way of Belief” and starting at the famous Triveni Ghat (in Rishikesh Market) with its temples and flower sellers, this 3 km path is perfect for an early morning walk. This beautiful promenade with its many benches gives you plenty opportunities to sit and enjoy the scenic views. The walkway leads all along the banks of Ganga and eventually straight onto one of the nicest Shiva temples with its own ghat in Rishikesh (Gangeshwar Ram Shri Bajrang Mahadev Mandir), and if you’re lucky you can see elephants across the river having their morning stroll. For those who continue walking: it will lead to the Barrage bridge and colony. 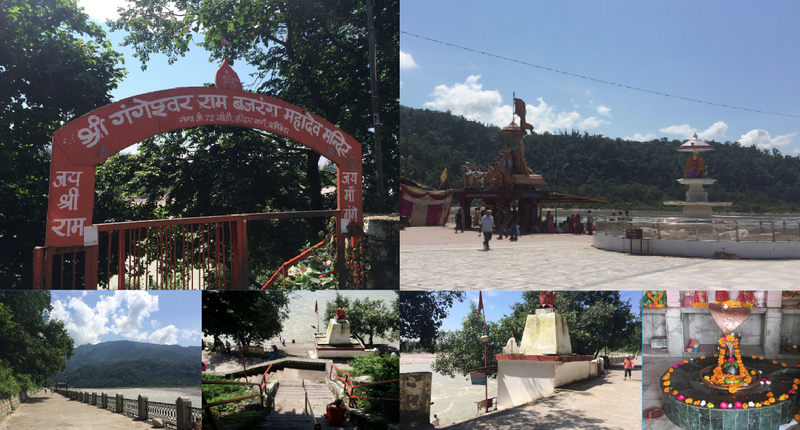 Leaving Rishikesh on the way to Badrinath you can reach the legendary Vashishta cave (ca. 45 mins drive from Tapovan). Vashishta is one of the seven Saptarishis (saints/wise men) who lived here 9000 years or so ago. He was also the spiritual son (mānasaputra/”mind son”) of Brahma (the Hindu god of creation) and Rajguru of the Suryavansha or Solar Dynasty, a mythological dynasty of ancient India. The cave is a power-spot and also called stairway to heaven by those lucky ones who experienced its true nature. It is the perfect meditation space for the serious seeker or devotee. Reportedly Jesus used to meditate in this area. Like other Rishis, also Vashishta was married: to Arundhati. In traditional Indian astronomy Mizar is known as Vashistha Maharshi and Alcor is known as Arundhati, both stars in Ursa Major. The pair is considered to symbolise marriage and, in some Hindu communities, priests conducting a wedding ceremony point out the constellation as a symbol of an ideal couple, marital fulfilment and loyalty. The Mahabharata describes Arundhati as an ascetic who used to give discourses to even the seven sages. The neighbouring cave is dedicated to Vashishta’s wife Arundati, hence the name Arundati cave.